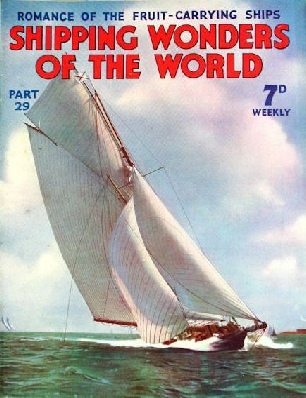 Part 29 of Shipping Wonders of the World was published on Tuesday 25th August 1936. This issue included a colour plate illustrating the Breaksea lightship in the Bristol Channel, which formed part of the article on the Port of Bristol. The plate was attached to page 909 of part 29. This week’s cover shows the famous old-time racing cutter Mohawk, her lee-rail awash. In 1896, the Mohawk won the Royal Yacht Squadron’s Queen’s Cup. Her owner at that time was Major Orr-Ewing. In the City Docks and in the docks at Portishead and Avonmouth are ample facilities for the handling of general cargoes. Most of the import of bananas from the Caribbean to Great Britain is handled at Avonmouth, where also are up-to-date granaries and oil storage installations. Bristol has been a great port from the earliest days of British seafaring, when nearly all our great mariners came from the West Country. From Bristol the Cabots set sail in 1497 to discover Newfoundland. Bristol was, in fact, the port of the Merchant Venturers, and to-day it still retains its former greatness and is one of the leading ports of the British Isles. Bristol’s principal imports are bananas, oil and grain, apart from general cargoes. This chapter is by Sidney Howard and is the ninth article in the series on Great Ports of the World. vessels were freemen and not galley slaves, as was the practice among Oriental nations. Despite their small radius of action - due to the fact that they carried no reliefs - the galleys were remarkably fast. One of them is recorded as having covered 168 miles in twenty-four hours, at a speed of seven miles and hour. As much as ten knots could be attained for short periods. THE BRIGANTINE DECOY-SHIP Q 17 was the Helgoland, 310 tons, built in Holland in 1895. She was armed with four 12-pounders and a Maxim gun. Her name was changed at one time to Horley. Stationed at Milford Haven, Pembrokeshire, she was renamed Brig 10 later at Gibraltar. 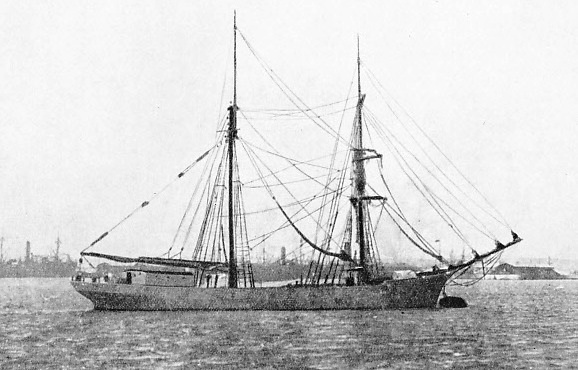 She was 122 ft 9 in long, with a beam of 23 ft 3 in and a draught of 8 feet aft. 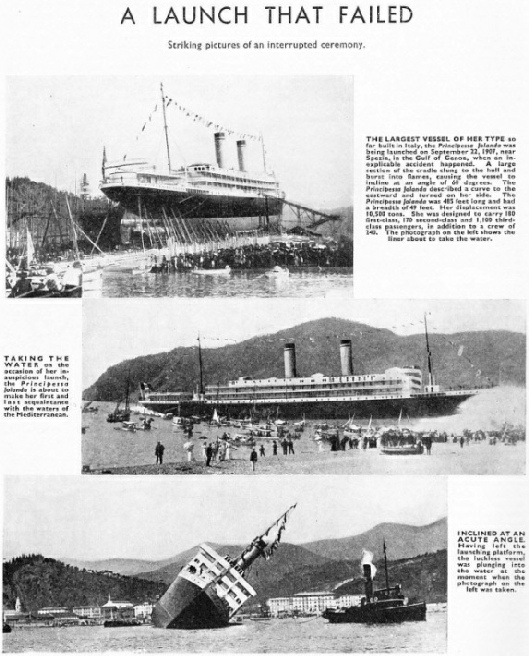 A two-page photo-feature on the Principessa Jolanda, launched on September 22, 1907, and shown below. The Sunderland firm of Doxford has long specialized in this class of vessel, and the ship illustrated above was completed in 1930. The Peebles is a shelter-decker, with a deadweight tonnage of 9,200 and a draught of 24 ft 8 in, her dimensions being 422 ft 9 in by 54 ft 3 in by 28 ft 8 in. She is propelled by a two-cycle opposed-piston Doxford diesel engine, developing 1,800 bhp at 115 revolutions. The speed of the Peebles is approximately 11 knots. The compactness of the main engine and its lightness, which are both attributable to a welded construction, have made possible a small machinery space, and only 40 feet out of the total length are required for the machinery. The main engine exhausts into a boiler which supplies steam for running all the auxiliaries necessary for the ship at sea; an oil-fired boiler supplies power required for the deck auxiliaries' use in port. There are four cargo holds. 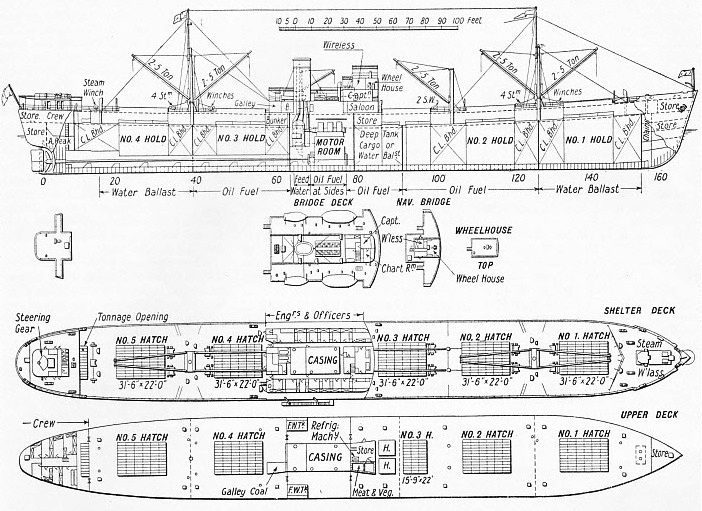 Nos 1 and 2 are forward of the engine-room and Nos 3 and 4 are aft, but between No 2 and the engine-room is a deep tank. Of the six double bottom tanks, the first and the last - Nos 1 and 6 - are for water ballast only. The use of the other holds - Nos 2 and 3, and No 5 - are for water ballast or for fuel. The use of these holds for fuel would naturally increase the radius of operation of the ship. The holds have a total capacity for grain of 402,990 cubic feet. Other spaces are also available, making a total of 569,600 cubic feet in all. The corresponding bale capacity is 511,150 cubic feet. The total water ballast capacity is 1,733 tons. Officers’ accommodation is amidships; the crew is aft in the ‘tween decks. This is the twenty-first article in the series on Merchant Ship Types. The story of sailing vessels that were used as trap-ships and decoys during the war of 1914-18, concluded from part 28. THE LARGEST VESSEL OF HER TYPE so far built in Italy, the Principessa Jolanda was being launched on September 22, 1907, near Spezia, in the Gulf of Genoa, when an inexplicable incident happened. A large section of the cradle clung to the hull and burst into flames, causing the vessel to incline at an angle of 60 degrees. The Principessa Jolanda described a curve to the eastward and turned on her side. The Principessa Jolanda was 485 feet long and had a breadth of 49 feet. Her displacement was 10,500 tons. She was designed to carry 180 first-class, 170 second-class and 1,100 third-class passengers, in addition to a crew of 240. 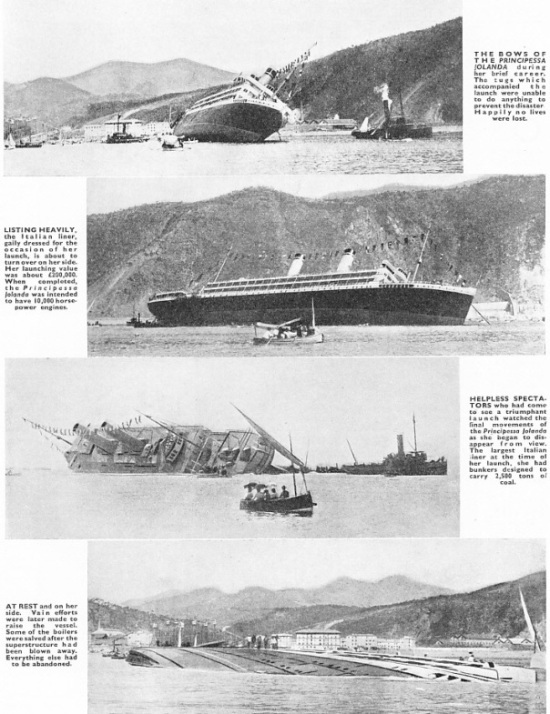 The photograph (top left) shows the liner about to take to the water. (Middle left) TAKING THE WATER on the occasion of her inauspicious launch, the Principessa Jolanda is about to maker her first and last acquaintance with the waters of the Mediterranean. The carriage of fruit presents special problems to the shipowner, for it is impossible to mix citrous and non-citrous fruit cargoes, because the one will spoil the other. Modern fruit ships are among the fastest cargo ships afloat. This chapter is by A C Hardy and describes the conditions prevailing in the fruit trade to-day, deals with the general design of the fruit ship and gives details of the most interesting vessels employed in the trade. This is the fourth article in the series Romance of the Trade Routes. Under the leadership of King Xerxes, an immense Persian army, supported by a fleet of unexampled size, invaded Greece in 480 BC. 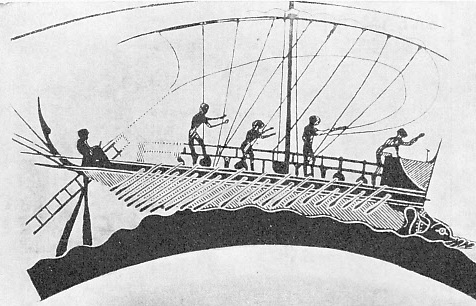 Undaunted by this menace, the allied Greeks met the Persian fleet in the strait between the island of Salamis and the Greek mainland, and totally defeated the invader. 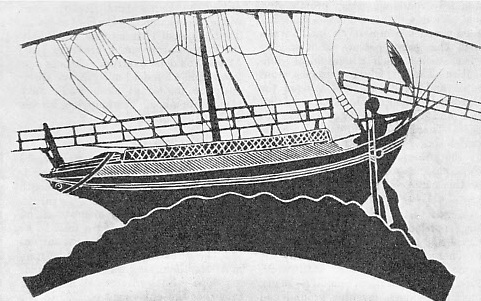 The Battle of Salamis was one of the first great naval battles, where the ships of the colossal Persian Empire were defeated by the superior tactics of the much smaller Greek fleet, just as many hundreds of years later our own small British ships defeated the Invincible Armada. This chapter is written by Lieut.-Com. E. Keble Chatterton and is the first article in the series on Decisive Naval Actions. WHITE-PAINTED HULLS (above) are characteristic of fruit-carriers. The Eros 5,888 tons gross, was built in 1936. She is a single-screw steamship with an overall length of 431 feet and a beam of 54 ft 6 in. She has a raked stem and a cruiser stern, and is designed mainly for the Central American and West Indies banana trade. (Above) INCLINED AT AN ACUTE ANGLE. Having left the launching platform, the luckless vessel was plunging into the water at the moment when this photograph was taken. THE BOWS OF THE Principessa Jolanda during her brief career. The tugs which accompanied the launch were unable to do anything to prevent the disaster. Happily no lives were lost. LISTING HEAVILY, the Italian liner, gaily dresses for the occasion of her launch, is about to turn over on her side. Her launching value was about £200,000. When completed, the Principessa Jolanda was intended to have 10,000 horse-power engines. HELPLESS SPECTATORS who had come to see a triumphant launch watched the final moments of the Principessa Jolanda as she began to disappear from view. The largest Italian liner at the time of her launch, she had bunkers designed to carry 2,500 tons of coal. AT REST and on her side. Vain efforts were later made to raise the vessel. Some of the boilers were salved after the superstructure had been blown away. Everything else had to be abandoned. THE ROYAL EDWARD DOCK at Avonmouth. The two extensions the Western Arm and the eastern Arm are seen in the top left-hand corner. The Western Arm is devoted exclusively to the oil trade, being nearer to the Bristol Channel. The large block of buildings in the centre is part of the Authority’s elaborate grain-handling system. The cold stores connected with the transit shed by two conveyor galleries are adjacent to the granaries. IN THE HEART OF TH CITY are the Bristol City Docks. 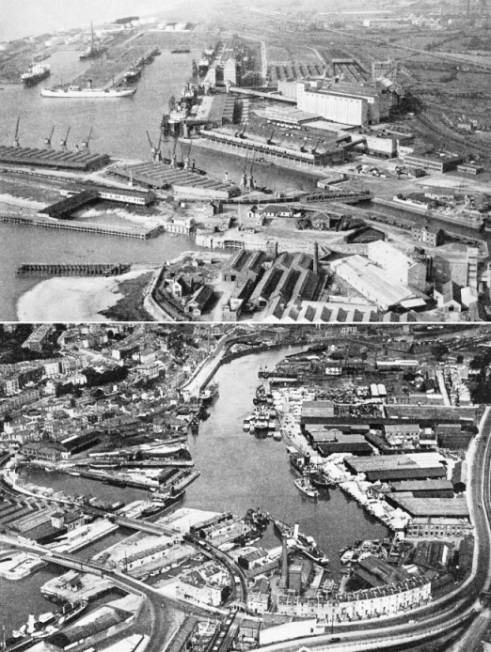 In the left foreground is the entrance from the Cumberaldn Basin and adjacent are timber wharves. The total area of the City Docks is 181 acres, 83 acres being water. 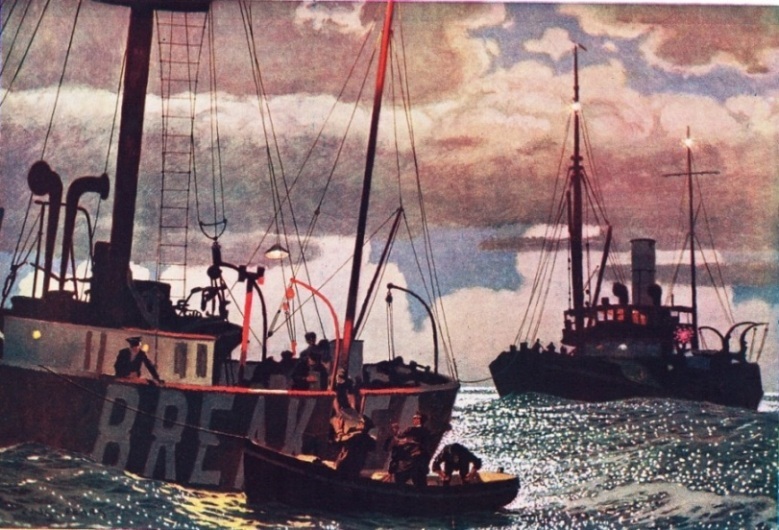 THE BREAKSEA LIGHTSHIP IN THE BRISTOL CHANNEL (below) is the subject of this arresting picture by Charles Pears, ROI. The artist has illustrated a most important event in the life to the men who operate the lightship - relief and provisions being brought on board from a Trinity House tender. The Breaksea lightship is well known to navigators in the Bristol Channel. She has a red hull and carries a ball at her masthead. Her light shows one white flash every fifteen seconds and is visible at a distance of eleven miles. Her fog siren when in operation gives one blast of two and a half seconds every twenty seconds. Her submarine fog bell gives three quick strokes followed by an interval of ten seconds. The lightship’s position is lat. 51° 20’ N, long. 3°18’ W, off the Glamorganshire coast. buntlines. Two steering oars are provided. Additional freeboard is given by the fitting of matting screens. The exact purpose of the ladder-shaped objects is unknown. The smaller one may be a gang-plank. Ships’ boilers at first were built on the lines of early land steam boilers, but before long improvements were incorporated to make the boilers more suitable for marine purposes. This chapter is by F E Dean and is the eighth article in the series Marine Engines and Their Story. ONE OF THE TUBULAR BOILERS fitted in HMS Janus in 1844, at the suggestion of Thomas Cochrane, tenth Earl of Dundonald. 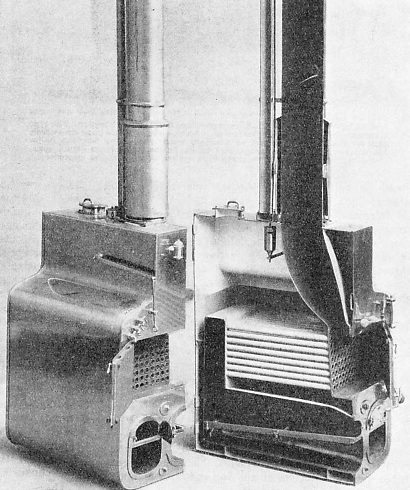 Four boilers were used in HMS Janus, and the model illustrated shows one of them in section with its three furnaces opening into a common combustion chamber at the back of the boiler. SLEWING ROUND (top right) to enter the East India Dock, London, where the cargo of bananas is discharged. The Jamaica Settler was built in 1910 at Birkenhead as the Highland Laddie, and originally designed as a meat carrier. She was a vessel of 7,256 tons gross, with a length of 405 ft 9 in, a beam of 56 ft 1 in and a depth of 34 ft 7 in. She was sold for scrap in 1935. 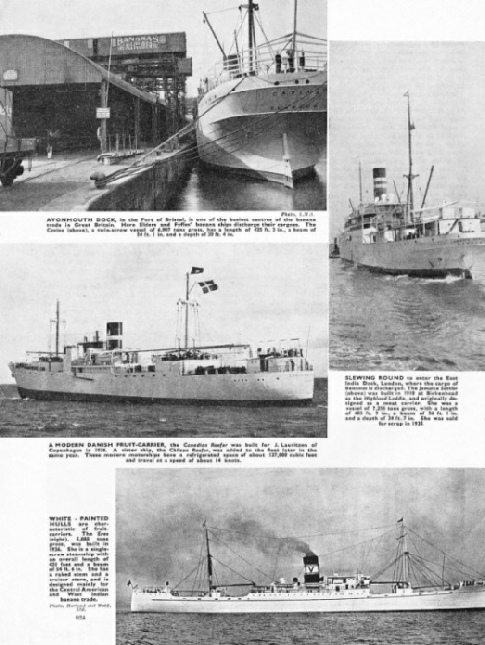 A MODERN DANISH FRUIT-CARRIER (centre left), the Canadian Reefer was built for J. Lauritzen of Copenhagen in 1936. A sister ship, the Chilean Reefer, was added to the fleet later in the same year. These modern motorships have a refrigerated space of about 127,000 cubic feet and travel at a speed of about 14 knots. With the famous sailing ships Erebus and Terror, Captain Sir James Clark Ross, the intrepid explorer and keen scientist, sailed through the pack-ice in search of the supposed Antarctic Continent in 1840-43. Ross was the first man to reach the Antarctic Continent which lay beyond the ice-pack that had turned back so many of the early explorers. This chapter is by Lieut.-Com. R T Gould and is the fifth article in the series on Epics of Exploration. It is concluded in part 30. 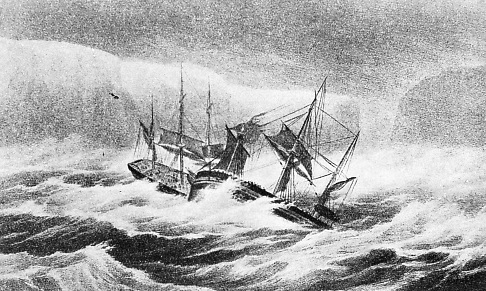 IN COLLISION DURING A SNOW-STORM, the Erebus and the Terror were for a time at the mercy of the wind and the icebergs. Two icebergs had suddenly loomed up in the falling snow and the Erebus was forced to hear to port in the path of the Terror. The ships collided and the bowsprit and fore-topmast of the Erebus were carried away. By a daring and clever manoeuvre Ross was able to separate the two vessels.